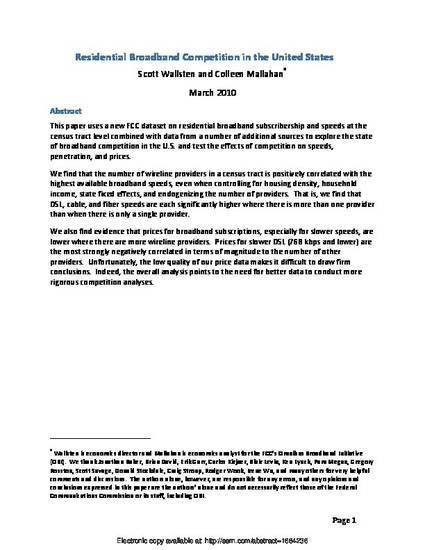 This paper uses a new FCC dataset on residential broadband subscribership and speeds at the census tract level combined with data from a number of additional sources to explore the state of broadband competition in the U.S. and test the effects of competition on speeds, penetration, and prices. We find that the number of wireline providers in a census tract is positively correlated with the highest available broadband speeds, even when controlling for housing density, household income, state fixed effects, and endogenizing the number of providers. That is, we find that DSL, cable, and fiber speeds are each significantly higher where there is more than one provider than when there is only a single provider. We also find evidence that prices for broadband subscriptions, especially for slower speeds, are lower where there are more wireline providers. Prices for slower DSL (768 kbps and lower) are the most strongly negatively correlated in terms of magnitude to the number of other providers. Unfortunately, the low quality of our price data makes it difficult to draw firm conclusions. Indeed, the overall analysis points to the need for better data to conduct more rigorous competition analyses.